I am not quite sure about you, but french fries are meant to be eaten, and not used as some sort of writing instrument. I suppose your sanity might be questioned if you were to bring the $4.99 French Fry Pen over to a boardroom meeting, as folks there might think that you have mistakenly carried your child’s stationery to the office. Well, I suppose it would go down well with a hamburger eraser or the like, don’t you think so? 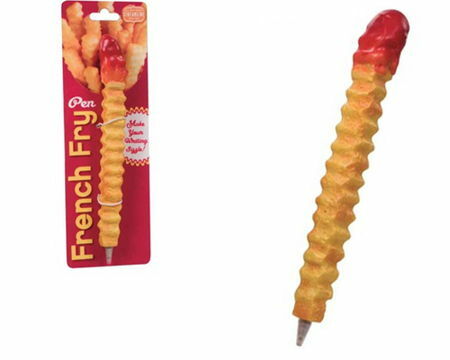 The French Fry Pen certainly turns heads whenever you pull it out from your pocket to have your John Hancock signed, and it is more than adequate to be a constant reminder each time you use it that there is a time for work, and another time for a break. Why not head down to the local burger joint during your break and have a basket of fries?